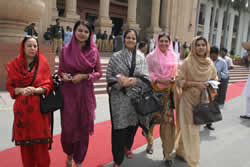 Female legislators of treasury and opposition made sarcastic comments against each other in the Punjab Assembly’s fourth session on Friday. Punjab Assembly Speaker Rana Muhammad Iqbal also amused the members with some funny remarks. Pakistan Muslim League–Nawaz (PML-N) legislator Tayyeba Zameer stood up and tried to say something but was prevented from doing so by female PML-Q members Amna Ulfat, Amina Jehangir and Samina Khawar Hayat. Tayyeba became infuriated and said, “The opposition’s female members have no etiquette.